Yes, the playlist is here... but is it infinite? 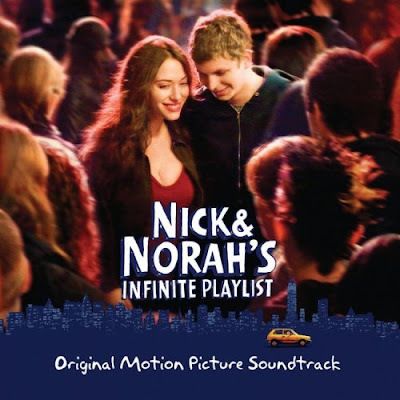 Based on the hip, wildly popular young adult novel by Rachel Cohn and David Levithan, Nick and Norah’s Infinite Playlist follows the young, romantically burned bass player Nick (Juno and Superbad’s Michael Cera) over the course of an adventurous, sleepless night lived after hours in the underground indie rock scene of New York. Joining him in his musical scavenger hunt to discover the location of a secret show featuring a legendary band is the far worldlier Norah (Charlie Bartlett’s Kat Dennings). And the two opposites attract over their taste in killer tunes in director Peter Sollett’s cinematic adaptation of Nick and Norah’s Infinite Playlist. Arguably the Fall release that’s been receiving the most buzz in the film world with infectious trailers and interactive opportunities for fans to build their own streaming musical playlist, video, or photo filled widgets from Sprout Builder and Sony Pictures, while the film itself doesn’t open until October 3, the soundtrack has been garnering pre-orders since August. Set to hit the street on September 23, the jam-packed, eclectic and catchy fifteen track album (which will also be released in limited edition in vinyl directly from Atlantic Records), offers listeners the chance to play musical detectives right along with Nick and Norah as we groove to the alternately snappy and splendorous offerings by some of indie rock’s finest bands who have yet to catch on to the general public. After only a few listens, with refreshingly a different artist for each and every tune, I was hooked. Ready to track down more from nearly every act included and thankfully via MySpace and band websites, you’ll be able to locate them far quicker than Nick and Norah do in the film. Of course, had they just grabbed a laptop, there would’ve been no need for a book, let alone a movie. The disc opens with the melancholic yet pretty “Speed Of Sound,” by the late Chris Bell which helps evoke Nick’s heartache audibly as it laments tragedy throughout the endlessly depressing lyrics making the beauty of the track seem like an ingeniously ironic counterpoint. However, Devendra Banhart’s “Lover,” a toe-tapping and peppy propositional come-hither tune with a great hook about ninety seconds in, establishes the sheer joy and optimism of whimsical and surprisingly funny new young love. Ratcheting it up several decibels, Bishop Allen’s “Middle Management,” a ska-punk lite track is a highpoint and used throughout promos for the film and can be heard as one of many soundtrack tunes in the veritable musical scrapbook that is the film’s official trailer. The quirky electronic keyboard sounding “Ottoman,” seems oh so much sweeter than one would assume given the band’s far scarier sounding name of Vampire Weekend. Additionally, it’s one of several tracks that I felt a kinship with as a fan of other experimentally prone bands like Belle and Sebastian and The Magnetic Fields as strings and other instruments join in while it continues. The retro sounding “Riot Radio” by The Dead 60s is exactly the type of bar band jump up and down song one would associate with the underground scene the characters navigate, not to mention it makes killer use of the guitarist. And wearing its punk roots proudly, it manages to work in a police siren as well, causing me to check my rearview mirror each and every time it played in my car. The innocuous, lighter and gentle “Fever” by Takka Takka backs off from the loudness of the previous number and serves as a great intro to one of my absolute favorites on the disc, “Xavia” by The Submarines. An epic track that actually ends and restarts, it invites a sing-along more than any other offering in a truly great collection and the musicality augments the female singer’s voice to breathtaking effect. Picking up the pace and fitting to the film and plotline is the addictive “After Hours” by We Are Scientists, followed by the groovy yet minimalist Band of Horses offering “Our Swords” which uses the lyrics and singer’s delivery as a sort of a call and answer with the rest of the band who accepts the challenge and strengthens the piece. Army Navy’s affable “Silvery Sleds,” is radio-friendly and has “now heard on the CW channel” written all over it. It builds with angst filled lyrics, sure to strike a chord with numerous characters on the teen friendly network and rocks harder as it builds. “Baby You’re My Light,” by Richard Hawley slows the album down with a romantic ballad, but just to make sure that we haven’t nodded off, Shout Out Louds serve up “Very Loud,” that deceptively begins slowly until it does grow very loud “little by little” as the lyrics promise, with a great hook again heard in the official trailer. Paul Tiernan’s “How To Say Goodbye,” is unabashedly romantic and makes due with an appropriately minimal amount of instrumentation. Tiernan wistfully sings about love gone wrong with only keyboard accompaniment and his voice decreases into a little above a whisper as he bids the song farewell and strings come in at the last moment, possibly to bid him a mutual adieu. The Real Tuesday Weld’s aptly titled “Last Words” is the last vocal track on the album and again reminded this listener of Belle and Sebastian with its majestic, quiet beauty until the album wraps up with “Nick & Norah’s Theme.” The sole composition from the original score is by the ridiculously talented Royal Tenenbaums, Bottle Rocket, and Rushmore composer Mark Mothersbaugh. As quirky and inventive as Mothersbaugh’s more famous works, it provides a terrific capper to a stellar album of mostly obscure artists. And no doubt that’s part of the reason they’re so damn cool and warrant including in a film about knowledgeable and hip music fans that you probably wouldn’t see caught dead listening to adult contemporary radio or Hannah Montana. While initially, I worried that the eclectic mix may seem a bit too far flung to go together well or as a friend bluntly phrased it, fearing that it appeared as though “a hipster party threw up.” Instead it is just the opposite and will no doubt serve as a gateway album to get listeners more acquainted with the other work from the bands and no doubt making other legendary soundtrack compilers jealous such as the king of cool movie music himself, Mr. Cameron Crowe.